Air Force tops Navy to stay undefeated. Weston Steelhammer watched the first half from the locker room. No doubt, Navy wishes he would’ve stayed put. 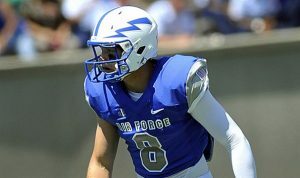 Suspended for a half because of a targeting penalty the week before, the Air Force senior safety provided a second-half spark for a defense that was already playing lights out. Steelhammer led a dominating defensive effort , tailback Tim McVey scored twice, including a 62-yard TD catch, and Air Force beat Navy 28-14 on Saturday to take a big step toward claiming the Commander-in-Chief’s Trophy. Steelhammer sat out the first half after being disqualified for a targeting call in the third quarter last weekend at Utah State. All dressed up and nowhere to go, he watched the opening half from the locker room, but soon made his presence felt by picking off a Will Worth pass with Navy driving in the third quarter. He had another late in the game. No worry about that. He’s the leader of a unit that had six sacks, eight tackles for loss, a fumble recovery and held a Navy team averaging 316.3 yards rushing to just 57. Here’s a stat that bodes well for Air Force: The previous 19 winners of this game have gone on to win the Commander-in-Chief’s Trophy, which represents superiority among the three service academies. The Falcons need only to beat Army on Nov. 5 to earn the trophy. If the teams all finish 1-1 in the round-robin competition, the previous winner – Navy – retains the prize. Air Force began to pull away in the third quarter when McVey scored on a 1-yard plunge. Robinette soon followed with his TD catch from Nate Romine, who finished 8 of 14 for a career-high 257 yards and two scores. Air Force will definitely receive some votes this week. The Falcons haven’t appeared in the AP poll since 2010. However, it’s hardly on their mind. Robinette was impressed by McVey’s one-handed, spinning catch . So much so that he’s going to add it to his list of plays. “I’m still in shock about it,” Robinette said. 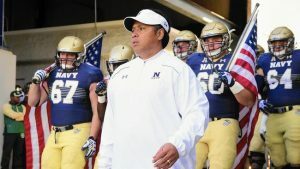 NAVY: The Midshipmen had a 19-game win streak against unranked opponents snapped. Just couldn’t get their vaunted rushing attack on track. “We have a top-5 team coming into our stadium next week so lick our wounds and move on,” Niumatalolo said.